The Sofia Region encircles Bulgaria’s capital city on three sides, but does not include it. The southern slopes of the Balkan Mountains punctuate the land to the north, and the Rila rises in the region’s south. The region has good weather all year, and there are lots of sports and recreational centres. Aside from Bulgaria’s biggest mountain resort, Borovets, holiday villas dot Iskretz, Kostenetz, and Dolna Banya. Ecotourism and hunting draw visitors to Sofia's over 300 protected natural areas, including the Marichini Lake, Skakavetz, Sini Vir, the caves near Lakatnik, the majestic waterfalls at Skaklia, and the woodsy areas near Chepan and Mount Kom. Sofia also has its share of historic and archaeological sites, including remains of Paleolithic settlements in the caves near Lakatnik, Roman era and medieval ruins, and a monument in the Arabakonak Pass dedicated to the Russian soldiers who fought for Bulgaria’s freedom from Ottoman rule in 1877. The region is mostly mountainous, although there are also wide valleys, many rivers, and mineral springs. Mining and ferrous metallurgy are well-developed, and the largest copper refinery in South Eastern Europe is here. Belgrade is easily accessible via the Belgrade-Sofia-Istanbul rail corridor. Getting to the other major centres of Varna and Burgas is also possible via the region’s good railway system. The small municipality and village of Anton doesn’t have any large resorts of fancy amenities, but it has an illustrious, if little-known, resident: the ruins of the ancient and venerable Elenska Basilica, which has been estimated to be from the 4th century, the earliest days of Christianity in Bulgaria. Anton has a lot of natural beauty as well. Part of the Central Balkan National Park is here. Seven rivers flow through the municipality, and a lake created by the Dushantsi Dam on the Topolnitsa River is a great place for fishing and swimming. Close to Anton is Koprivstitsa, known for its National Revival buildings and the National Festival of Bulgarian Folk Art (or the Koprivstitsa Festival), held here every five years. The town of Dolna Banya makes up the entire municipality of the same name. Built on the slope of Rila Mountain, Dolna Banya is close to the Maritsa River, the longest river that is completely within the Balkans. The fresh water and mineral springs of the area makes it an ideal place for a resort—and so there is one, with villas, a hotel, a recreational centre and a restaurant. A golf course and more villas are planned for the municipality. 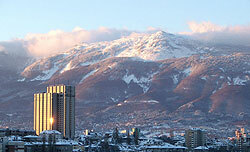 The prime attraction of the municipality of Samokov is Borovets, Bulgaria’s biggest winter resort. Though it is also the country’s oldest resort of its kind, Borovets is thoroughly modern, with luxury hotels, shops and restaurants, bars, nightclubs and even discos. Bulgaria’s only ski jumping hill is here, as are a biathlon track, a snowboard park and a large sports arena. Borovets hosts several winter sports competitions every year. Those who aren’t uch for winter sports can go camping and fishing instead in Shtarkelovo Gnezdo (Stork`s Nest) near an artificial lake, or take the cure in the thermal waters of the Balchin Bani not far away. The presence of Borovets and Samokov have made this part of the region a prime area of development, and the village of Beli Iskur near Rila National Park has not been left out. There are plans to turn it into a winter resort and a centre of ecotourism. Hotels, folklore museums and arts and crafts centres will be built in the village. Rila is already a tourist draw in the summer, with its horse-riding, rock-climbing and hiking facilities. It also has two vastly different summer festivals: the Festival of Rila Zelnik in June, celebrating the local pastry of the same name, and the 6-year-old Rock in Rila Festival in August. There is also a beautiful lake in Beli Iskur: Strashnoto, whose name means “frightful”.